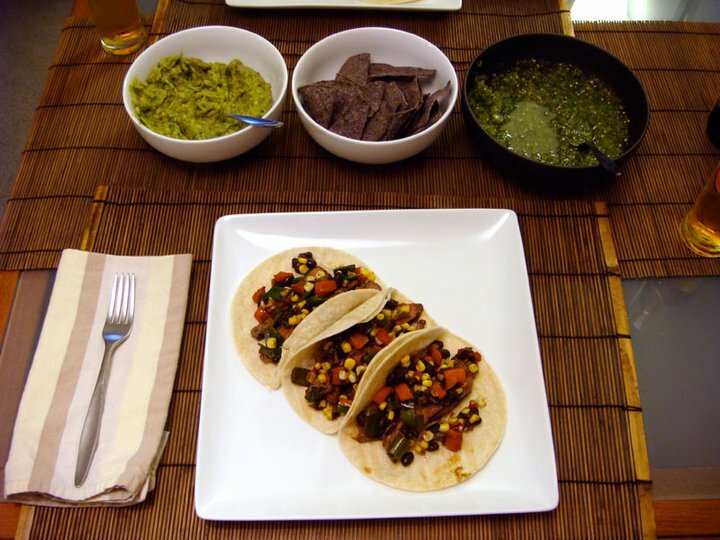 Skirt Steak Tacos with Black Bean and Corn and Tomatillo Salsas – Top Chef Masters Night | Eat.Drink.Life.Love. Tailgating food was the challenge for this Top Chef Masters episode and all of the food — from grilled pizza to Korean short ribs — looked fantastic. However, we couldn’t resist the marinated skirt steak tacos with various salsas (recipe here) from Susan Feniger, the queen of Southwestern cooking. I picked up a Thousand Hills skirt steak and used my lunch hour to marinate it in olive oil, lime juice, cilantro and cumin. The recipe also calls for serrano chile, but I was in a hurry so I forgot. No worries because the steak was still delicious! The recipe also calls for three separate salsas plus guacamole, but there are two of us so we cut out the chipotle salsa. So while K prepared the simple tomatillo salsa, I cut the fresh corn off the cob, roasted the poblano and red peppers in the oven and put together the corn and black bean salsa. K cut back on the serranos in deference to my mighty Minnesota palate (which is getting better, but is still not into super spicy foods) and, upon tasting it, realized it was still really hot. The addition of some extra lime juice and reassurance that when eaten with other food items it would be less fiery made me okay with its heat. I am not a fan of beans unless they’re fresh. Consequently I hate baked beans, black beans, etc. * I am also not a fan of most food that comes out of a can as it reminds me of school cafeteria food. Therefore, I didn’t want to ruin my delicious fresh corn salsa with mushy black beans. K, on the other hand, loves black beans. To get around this potential bean conflict, I simply sautéed the corn, peppers and scallions then split the goods in half in the pan before adding black beans to K’s “half.” Genius (if I do say so myself). * The exception to the black bean rule is Deena’s Gourmet black bean chipotle hummus mentioned elsewhere in this blog. While I was sautéing, K was making a simple guacamole with avocados, lime juice, a little bit of serrano, some onion and cilantro. When all the side dishes were ready, I popped the steak in the grill pan for a few minutes. Then I thought it seemed done so I took it out and let it rest for about seven minutes (the max I can wait when I’m that hungry). Upon cutting it, I realized the steak was woefully undercooked so I quickly threw it back in the grill pan for a few more minutes then let it rest for a few more. It was still pinker than was ideal, but the flavors of the marinade were fantastic. We assembled all the pieces and popped some blue corn Frontera chips (the Rick Bayless brand) in a bowl and boom … dinner. It was a little messy (the juicy steak and salsa kind of soaked through the tortilla) but soooo good. My chip strategy was to dip into the tomatillo salsa first, then the guac for the perfect balance of tangy, spicy, salty and crispy. The fresh sweet corn popped pleasantly with each bite and the whole combination was so savory. If you’re looking for a great steak taco recipe, this is it. It takes very little time and all the flavors of summer can be crammed into bite after bite. It’s perfect party (or tailgating) food.